Rothman, N., K. P. Cantor, A Blair, D Bush, JW Brock, K Helzlsouer, SH Zahm, LL Needham, GR Pearson, RN Hoover, GW Comstock, PT Strickland. 1997. A nested case-control study of non-Hodgkin lymphoma and serum organochlorine residues. The Lancet 350 (July 26): 240-244. The graph compares the relative risk of non-Hodgkin's lymphoma for three conditions of exposure. 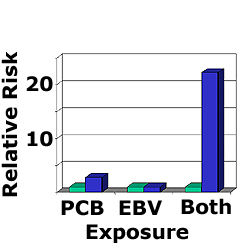 On the left (above PCB), the two bars compare groups of people with little exposure to Epstein Barr Virus but either low (green) or high (blue) exposure to PCBs. Comparing these two bars shows a slight but significant increase in risk of NHL. The pair of bars in the center (above EBV) compare people with relatively low PCB exposure and either low (green) or high (blue) exposure to Epstein Barr Virus. This shows no alteration in risk due to EBV alone. The pair of bars on the right compare two groups of people: low EBV and low PCB (green) vs. high EBV and high PCB (blue). This striking result shows over a 20x increase in risk if exposure to both agents, the contaminant and the virus, is simultaneous and relatively high. This result does not prove causation. It suggests, however, that an interaction between the contaminant and the virus may be increasing the risk to NHL dramatically. One hypothesis is that the contaminant, known from animal studies to affect immune system function, is reducing the ability of the human immune system to resist the impact of an infectious agent.